I'm not a big fan of the prequels, but have thought about at least getting the main villains from that trilogy. 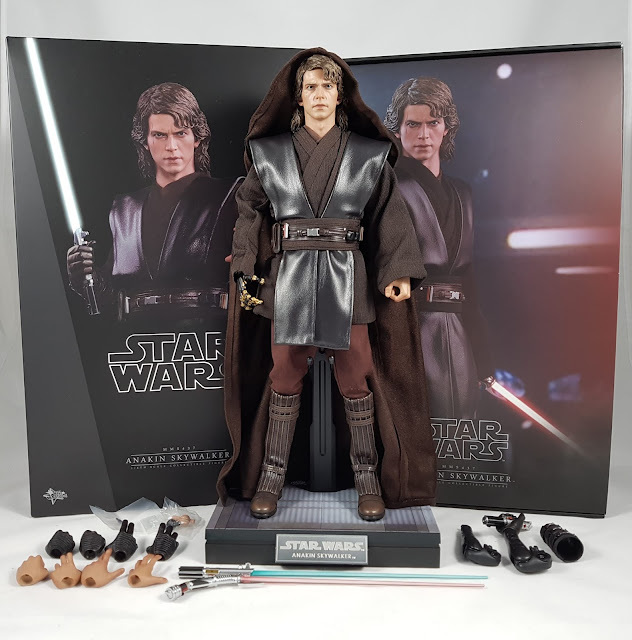 I already have the Sideshow Darth Maul and Jango Fett figures, and just couldn't resist getting this new Hot Toys Anakin Skywalker. Click through below to check out my full video review over on the Kool Kollectibles YouTube channel. The packaging is the usual simple, yet classy style from Hot Toys. The cardboard insert and cover both give a good look at the prototype figure, and the final production version is very close in quality. The array of accessories is decent at this price point, with a couple of lightsabers. 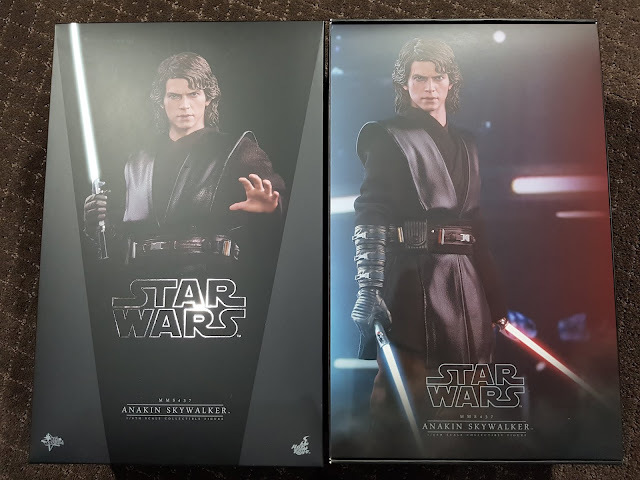 It's a shame that the Dooku saber wasn't also included as a light up option, but I guess having two swap out arms was a step too far for Hot Toys. Luckily I don't really use light up features and remove all the batteries anyway. The swap out hands cater for many poses that you would want, with both gloved and ungloved versions. My favourite accessory would have to be the swap out robotic arm. The articulation in the forearm and fingers is very nice, as is the glossy black and gold paint app. The main accessory that I wish they had included was of course a swap out head sculpt with Sith eyes. 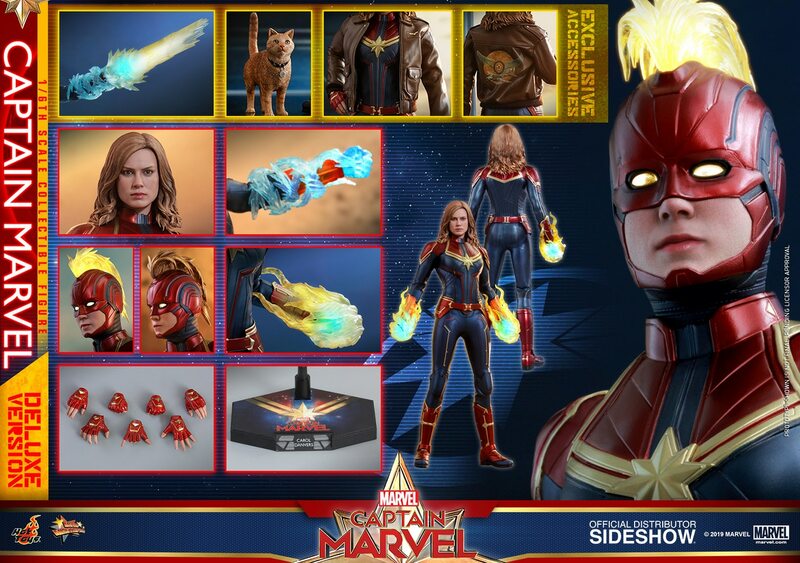 Hot Toys have just announced a toy fair exclusive that has that head sculpt, but it would've sweetened the deal on this version if it was included. It's a shame that they include those swap out head scuplts with some figures, but not this one that was screaming for it. But at least collectors now have the options on buying either version. The Jedi robe has been a point of discussion with collectors. 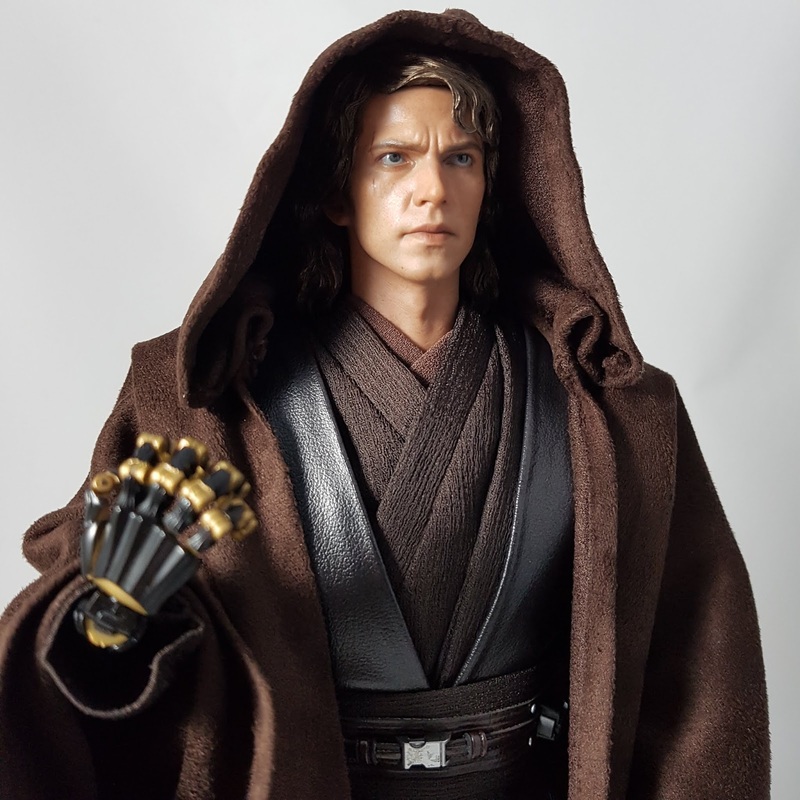 There is a warning in the instruction manual to not let the robe touch the head sculpt or hands for long periods because the robe could stain them. In fact, the fist that came on the figure by default out of the box already had a small stain where the robe had touched it in the packaging. Collectors have resorted to soaking the robe in water to remove the excess dye. This apparently helps prevent the risk of transferring the dye to the figure. I haven't tried that myself, but will have another closer look over the figure to see if I can be bothered doing that. I have tried putting the hood over the head sculpt and using the wire in the hood to shape it around the face. It's pretty tricky, and I still haven't folded it in a way that looks realistic or as accurate to the movie as it can be. I'm pretty close to just giving up on that and having the hood just folded around this shoulders! The rest of the outfit on the figure is very nicely done. There are a number of layers to the outfit tailored from different materials, and that all adds to a nice premium look to the figure. The fake leather folds across the shoulders and front are soft, and crease fairly realistically. Mine appears locked in place in the centre as I can't really adjust the centre position. But it can be pulled or tightened around the shoulders to prevent them ballooning out too much. There's a wire in that area too so it can be shaped around the shoulders. The pants are nicely done, but I would be very careful not to pull them out of the boots, or to remove the boots. It would be an absolute pain in the arse to put them back into the boots since there is very little tolerance. The boots themselves are a soft material, which gives them a nice give around the ankles for more realistic articulation there. So overall, I'm pretty impressed with the outfit. The head sculpt is also a standout for me. The paint app is the usual high Hot Toys standard - I don't think any other 1/6th scale company puts out quality head sculpt paint apps as consistently as Hot Toys. The scar is nicely painted, and the sculpt even has the tiny marks on this left jawline just like he has in real life. It's that attention to detail that sets Hot Toys apart from the competition. Overall, another solid Star Wars release by Hot Toys. I look forward to getting the Revenge of the Sith Obi-wan to complement this Anakin.